NASHVILLE, TN — According to government statistics and key research institutes such as Politifact, more than 72 percent of children born in African American homes are born out of wedlock. Among those numbers are large percentile are single -mothers have custody and are the head of the households. Those are not great numbers but there is some surprising good news to report when it comes to single parenting and the African American community. According to Josh Levs, author of the book “All In,” about 2.5 million black fathers are living with their children. William Miller III is a young father here in Nashville who’s a part of that two and half million black fathers who’s with his children. Not only is the young 33-year-old living with his children but he has custody of three that he’s raising as a single dad. Miller has four children, with a fifth one (a daughter), on the way with his current fiancé. The newborn is due to make her arrival by the end of this week, just in time for Father’s Day. The young divorced dad said he gladly took custody of the three little ones that he and his now ex-wife have together. He has a 10-year-old son who lives with his former fiancé. “I know what the statistics say about black fathers not being around their kids but when my wife and I divorced, I wanted to make sure my kids wouldn’t fall into one of those negative stereotypes,” says Miller. He knows his decision to get custody of his children may not be a popular one among some but a lot of his buddies are very supportive of him stepping up to the plate, so to speak. “Yeah, I’ve got a lot of people who encourage me to keep up the work that I’m doing as a single dad because it’s not that many black fathers out here who are doing this. It’s a big job but I enjoy being a dad. I want to make sure my kids are raised the right way,” says William proudly. 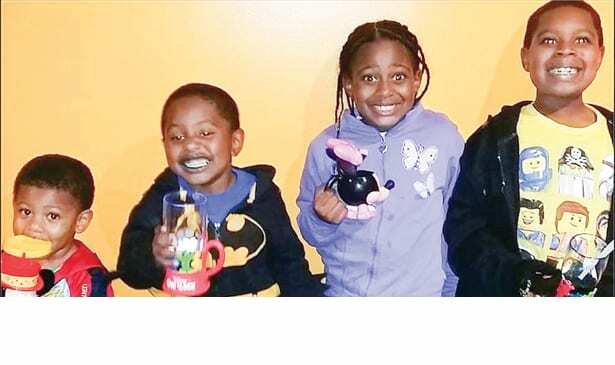 The Miller children are: William IV (age 10); Ameriah (age 9); Treyshun (age 6); Rondarius (age 4) and the upcoming new born daughter will be Arian. William is originally from Memphis, TN. One of his dreams was to have a career in the hip hop music industry. But when fatherhood called at an early age, he put his dreams aside for a while and assumed the role of being a dedicated dad. But that doesn’t mean that he’s totally abandoned his dream. He has plans to release his autobiography (“The Plantation”) and will be releasing a new music EP later this year. Miller gladly admits that he’s a real hands-on dad. He’s maintained a full-time job for the last 9-years at a local communications company, but somehow finds the time to still do laundry, housekeeping, dishes and cooking. But says he’s not exactly that good with combing his daughter’s hair. “We start our days early, with kids running around like kids do,” says William with a laugh. “Sometimes I play video games with the them like Xbox, or we watch movies. But I’m also teaching my children about responsibilities and chores. Each child contributes to the housework. They clean their rooms, help put dishes in the dishwasher, put away their toys and clothes.” This super dad has also made several school field trips, and makes sure two of the children get to karate class each week. William’s no-nonsense approach about school and education is paying off. His daughter recently graduated from third to fourth grade as an honor student. Williams says that he hopes that by sharing his personal story of being a young father with the public hopefully, it will encourage other young African American fathers out here to take the same hands-on approach with their children.